My editor once told me that I have a ‘marauding beard’. I’ve never been able to decide whether she meant that the beard itself was out of control, invading my face with wild abandon, or whether she simply thought it was a good beard to go marauding in. Either way, as an historian of the Viking Age I took it as a compliment. 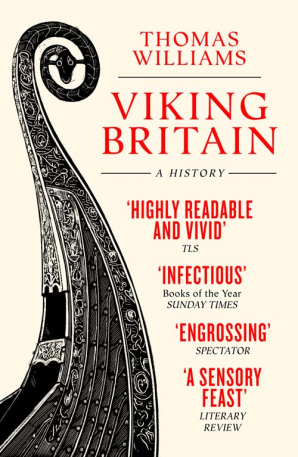 Of course, the idea of the marauding beard plays nicely to stereotypical images of Vikings, their wild hair and beards a manifestation of the berserk fury of the north. But – as ever when it comes to the Vikings – that image is only partially true. Marauding Vikings certainly wore beards, but Viking beards rarely marauded unchecked. The Norse Sagas provide a range of beard-related nicknames, offering a window onto a hairy world bursting with shapes, colours and textures: here we can find Silk-beard and Fork-beard, Thin-beard and Scratchy-beard, Wag-beard and Coal-beard, Fox-beard and Gold-beard, Broad-beard and Dangly-beard, Black-beard, Blue-beard, Red-beard, Grey-beard … even the hard-to-picture Flask-beard (and the rather less imaginative ‘Man-with-a-beard-from Mostr’). On the other hand, beardlessness, the sagas suggest, was not a desirable attribute. In the Saga of Burnt Njal, the eponymous hero is mocked as a ‘beardless old man’ (Old-Beardless) and his children as ‘little dung-beards’ (Dung-beardlings). The Sagas were written down in the Middle Ages, but there is plenty of evidence for hairy faces from the Viking Age itself. Numerous carvings depict men and gods sporting a variety of well-barbered facial hair-styles, from neat goatees and twirling mustachios to long ropes of coiling beard-knots. Hirsute figurines, known affectionately as ‘beard-tuggers’, have been found from across the Viking World. A famous example from Iceland is thought to depict the god Thor, his long beard (described in poetry as red and bristling) morphing into a hammer gripped in both hands. Odin himself was known (amongst many, many other names) as Grey-beard, Long-beard, Drooping-beard, Drooping-moustache, Red-moustache and Horse-hair-moustache. When mourning the death of his son Baldr, the god allowed himself to become wild and unkempt, refusing to wash or comb his hair (including, presumably, his beard). This, however, was a noteworthy outward manifestation of grief, a tearing up of social norms to signify intense distress. Under normal circumstances, being well-turned out was good form. Keeping the face-fungus in order was a key aspect of maintaining an impressive public image and, amongst other grooming gear, one of the most frequently discovered Viking Age artefacts is the comb. Highly decorated, over-engineered, crafted from deer antler, these were prize possessions. Indeed, the manufacture of combs was a major part of the economy in Viking colonies like York and Dublin. Don’t be a dung-beardling – groom like a Viking.